With fall upon us, this is a great time to do a wardrobe edit while swapping out seasonal clothing. Donating clothes you know longer need or want and discarding those that are too worn or damaged to donate, trims down your inventory allowing you to get a clearer picture of what is missing or needs to be replaced. I do this twice a year to keep my wardrobe to a minimum. Trending this Autumn are the rich warm colors of burgundy, olive, and mustard. These colors work beautifully well together and easily evoke cozy thoughts of the harvest season. Just because these three colors are pretty dominant this doesn’t mean you have to buy new things or even wear all three colors at once. Pairing with other complementary colors or adding an accessory like a hat, scarf, belt, or jewelry will still give you with a pulled together look. You’ve probably noticed that in the above combinations I used navy, black, white, gray, cream and tan to work alongside any of the three main colors. A felt hat could be worn with any or all the combos. When feeling and looking good come together, the natural outcome is confidence. 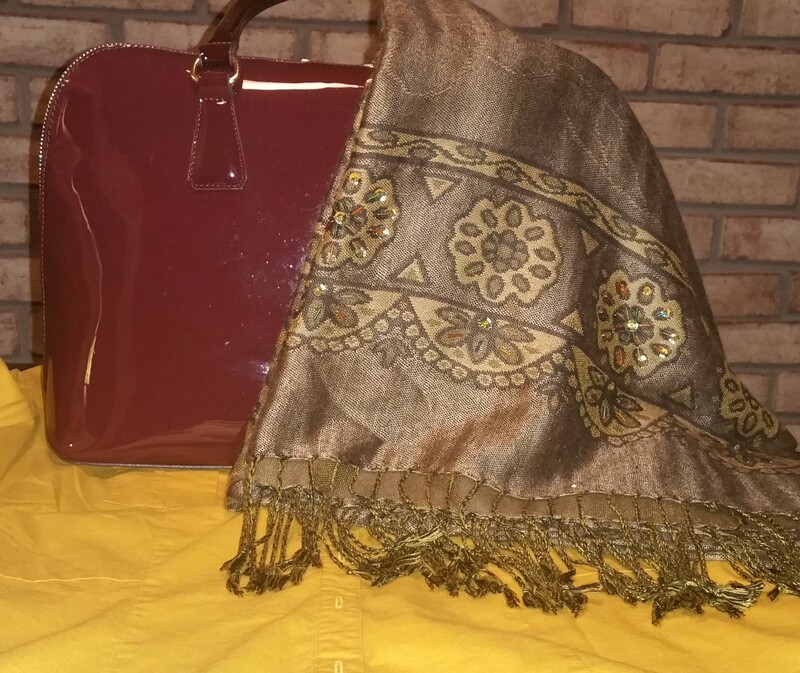 In the photo a burgundy handbag and olive embellished fringed wrap sit atop a mustard colored top. Stephanae, like you, and probably everyone else, I feel summer is ending way too soon, but who doesn’t love Autumn? Windy evenings and log afternoon shadows with pink hues at dusk, and all the leaves changing into a kaleidoscope of color. Now there’s a picture. I’m bettin’ on you Paul. You always come through. I love autumn. I look forward to it every year. Maybe it has something to do with the fact that I love all things pumpkin! This year, I’d like to teach myself how to make pumpkin scones. Most people get sick of the “pumpkin spiced” trend halfway through October but not me! I love the memory of rolling in leaves. The smell of those leaves is autumn and my favourite season and my chidhood. I still like them and don’t understand why all leaves need to be removed from my yard, but other people have different ideas. I think that is what fall is all about. Hi Kerry, thank you for stopping by. Your comment reminded me that I need to do a post on color from the perspective of people with varying degrees of vision loss. I’ve talked with some people who’ve never seen color and don’t care and others who feel quite the opposite. I’ll put together some notes and contact you via email. I agree with you on the leaves being part of what Fall is all about. Where I live at now I’m surrounded by trees and least here they do not clear them until just about all the trees are bare. It’d be impossible to keep up trying to clear them even once weekly. I forgot to mention that my other favorite thing in the Fall is this awesome Dutch Apple Pie from a restaurant I frequent. Thank you for sharing with us a beautiful story about the colors! You are welcome, spend good time reading your posts! I love your description of Fall! It is so lovely! Thank you Lynz, Fall is such a lovely season. Ah yes, as a youth those golden leaves were indeed a place to roll around in and have some real fun with. Now…those same leaves have to be picked up and bagged. The innocence of childhood replaced by the responsibilty of adulthood. That being said I can still enjoy them turning color before they detach and become part of the lawn! Nice post. Those colors would look good on you. I tend to wear brighter colors that pop, ones without that gold added tint..green plus gold..olive green, red plus gold…burgundy, etc.